The clearest photos of the new 911 GT3 have arrived direct from the Nordschleife. The current generation Porsche 911 Carrera S has received many plaudits for its terrific performance on the Nurburgring, completing a lap as fast as the previous generation 911 GT3. Well, the 991-series 911 GT3 has just been spotted testing around the famous and embattled German racetrack and we are salivating at the lap times the new racing-tuned version should put down. Set for its official debut next year, the Porsche 911 GT3 is wearing scant camouflage and boasts its trademark robust rear wing. 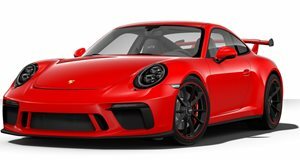 With a track-tuned suspension and a lighter curb weight, the 911 GT3 is expected to run on a 450-500-horsepower version of Porsche&apos;s latest 3.8-liter flat-six. If previous GT3s teach us anything, the new model ought to achieve astounding levels of performance. The naturally-aspirated engine could be coupled to either a new-fangled dual-clutch transmission or a traditional manual, but either way look for seven speeds keeping the power in the sweet spot on its way exclusively to the rear wheels. Typical of track-focused models, the new 911 GT3 will be wider, lighter and have a more aggressive aero package.